Wait...is ultra-violet the color of 2018? Well, I think that's a nice color and all, but you'll continue seeing me in all shades of gray this year. I just can't get enough of it. Later on I'll have to do a post all about my favorite color combos. 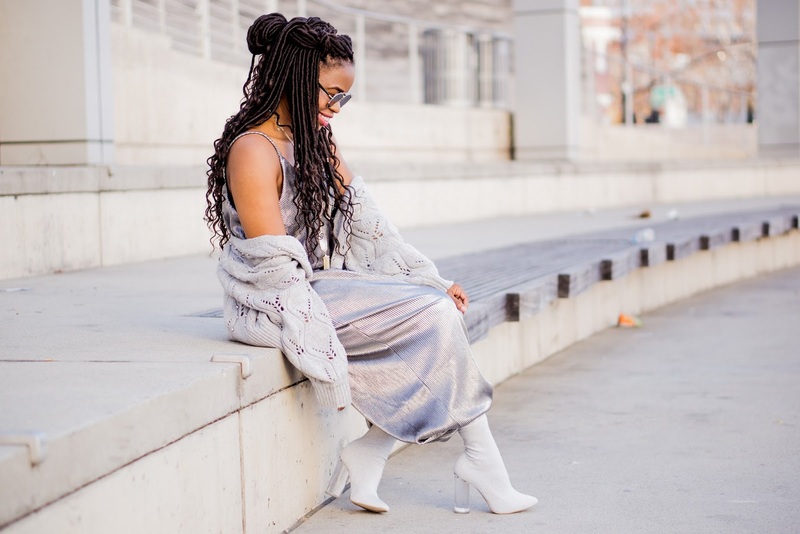 Anyway, you guys know that I had a dress option for New Year's Eve all planned out -- this faux fur and feather trim bodycon number -- but I was at Target the other day and came across this jumpsuit that I just couldn't get enough of! I mean, you know how I feel about jumpsuits! I thought it would be fun to rock a jumpsuit for a New Year's party, especially if everyone else is wearing a skirt or dress. Plus, it's shiny and silver so I'm basically a human disco ball. 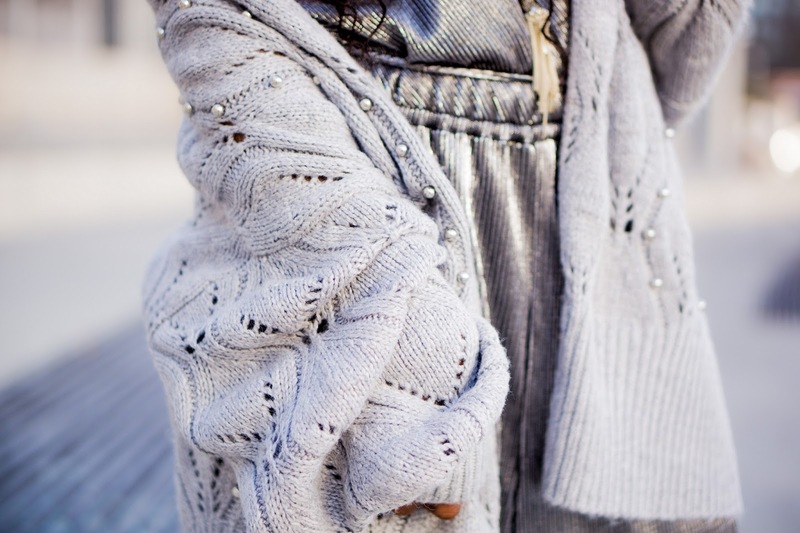 And the cool pearl embellishments on the sweater make a warm piece of clothing that much more chic. But I had to switch it up a bit by tucking in the wide legs of the jumpsuit into the sock booties. Hammer time, lol. Isn't target the best!That silver jumpsuit is a great find! Happy New Year Cheryl! You look so fresh and vibrant in these pictures. 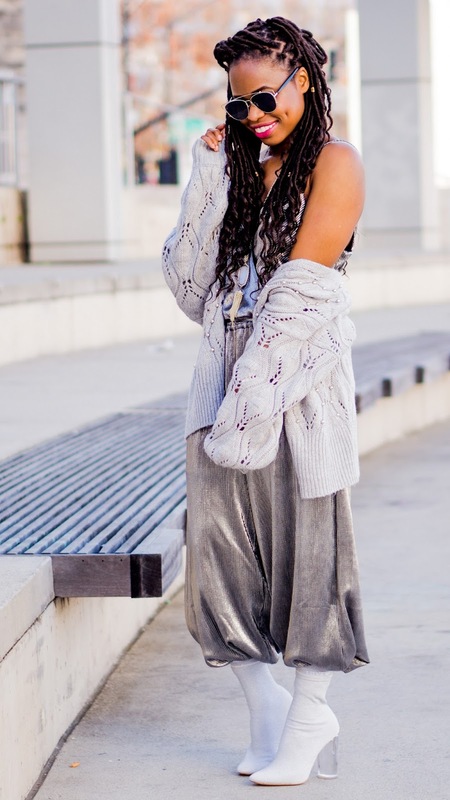 Love the silver jumpsuit. I have been preferring them over dresses lately too. Happy New Year!!! So Unique and Fabulous. This was a great diversion from all the dresses in the blogland. Happy 2018 my Dear. That jumpsuit is so pretty. I love how you styled it. Love this jumpsuit on you, Cheryl, and the pearl detail on the sweater is da bomb:) A great outfit to ring in the new year. This is a fun, comfortable and nice outfit. Definitely perfect for new year's eve because you can move in it. Ha!! I love it Cheryl. Beautiful! That outfit is so fly! I love silver and sparkle to ring in the new year! Love how white boots too! This look is everything! Love the metallic!!! Oh yes, this is TOO fun! I love it and it's perfect to kick off a fun new year! You are so so so fabulous lady! I am LOVING that sweater paired with the jumpsuit. LOVE this bold outfit! You are pulling it off so well. 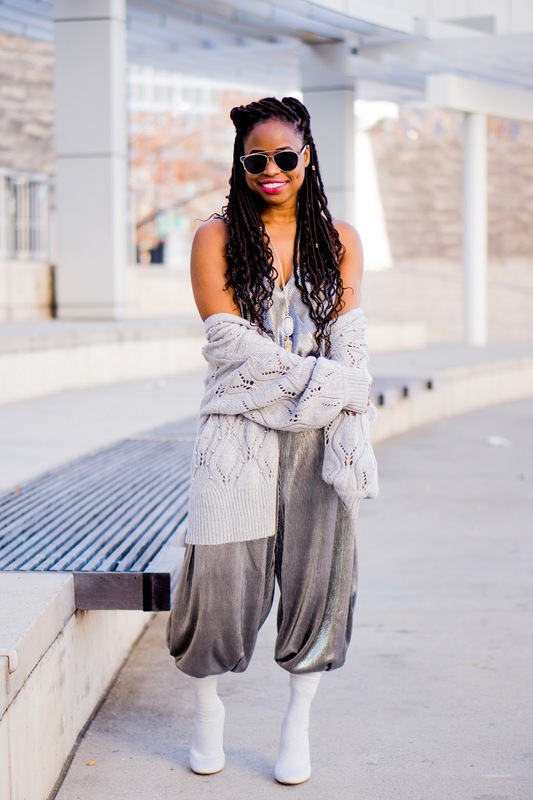 I would have never thought to put that cozy cardi with the jumpsuit but I love it paired together! Ultra violet hug. Sounds good. And that IS a fun jumpsuit and yes perfect for NYE unless you have too many cocktails. Love how you styled it here with the white boots. I bet you stole the show. 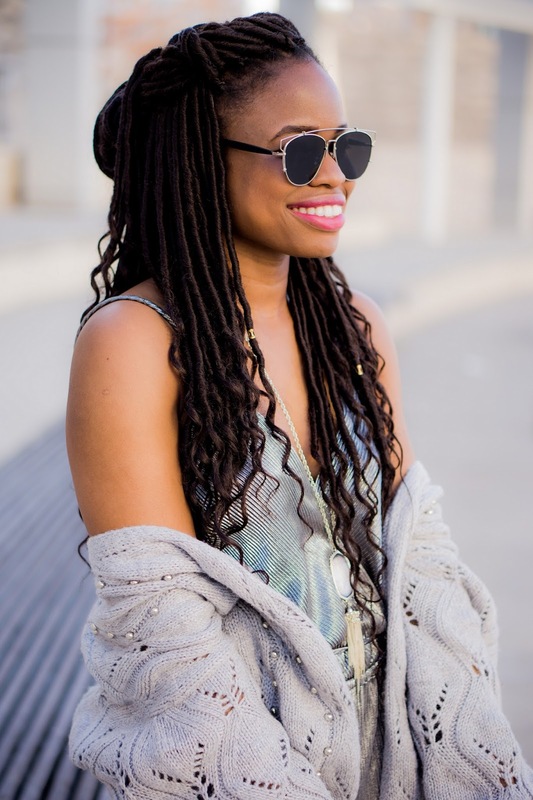 Love how you styled this jumpsuit! Such a fun outfit & looks great on you! I am loving that jumpsuit, it's such a pretty color and I love how you styled it with the white boots and fun chunky sweater! This jumpsuit certainly is a great statement piece, and so fun to ring in the new year with! Hope you have a wonderful 2018! So cute! Easier to dance the night away in a jumpsuit! Happy New Year! That's a lovely jumpsuit, and an even lovelier sweater! That looks so soft and cozy. Love the pearls on it too dear. Going crazy over the fact that this is a Target find! So chic lady! SO obsessed with this metallic look! It's stunning on you. Doesn't Target have the best stuff?? I know you are featuring the jumper but I am all for the cardi. That jumpsuit is so festively fab! Happy new year Cheryl! WHAT A FUN LOOK!!! I love that jumpsuit and that adorable cardigan!! !